In summer 2019, Leonardo will once again be hosting its Robotic Games. Working with Rampaging Chariots, the Games see young people testing their powerful and lightweight robots in a series of challenges. Hundreds of teams from schools, colleges and Air Training Cadets groups have taken part in the Games in recent years, and we expect many more participants across the company's sites in Edinburgh, Southampton, Luton and Basildon in 2019. The first competition of 2019 will be held in Edinburgh on 1 June, with registration opening in January 2019 for all four tournaments. 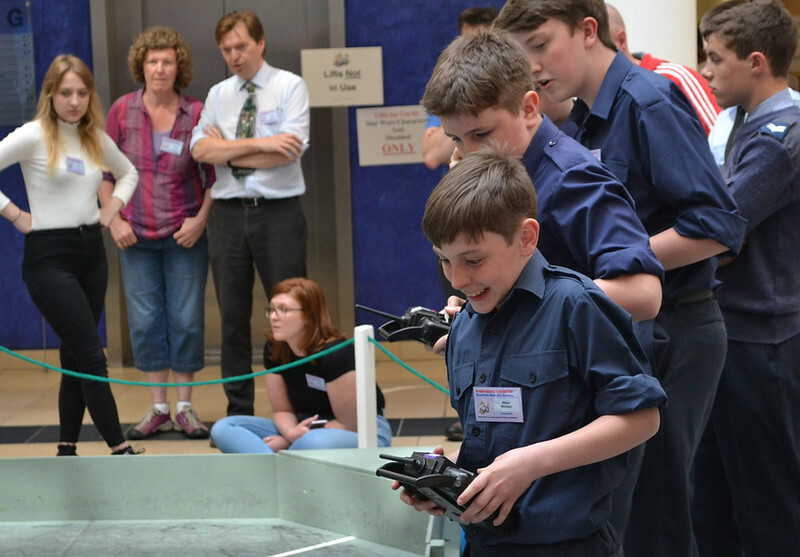 The Rampaging Chariot is a radio controlled robot built from a kit provided by Leonardo, which is then modified and improved upon by schools and youth groups. The kits were created by Leonardo engineer and famous test pilot, Peter Bennett, who designed and built the Typhoon robots featured on the television programme Robot Wars – winning many awards along the way. Rampaging Chariots race side by side through a 20m assault course consisting of a series of obstacles designed to test both robot and driver. The fastest eight robots go forward to the quarter final and the knockout competition. A five second penalty will be given for each pole knocked over and a 15-second penalty for each obstacle not completed. Teams have two minutes to complete the course with the distance travelled recorded. Two Rampaging Chariots compete in a knockout competition to push their opponent from the 1.85m (6ft) diameter ring (dohyo) within one minute. If both robots fall off, the winner is the last to touch the floor. At the one minute time-out, the robot furthest from the edge wins. The winner is the best of three successive bouts. A random order of participants compete two at a time in a knockout competition. A line attaches the robots to each other. Each machine stands equidistant on either side of a chasm. The winner is the machine that pulls its opponent into the chasm. In the event of neither machine being pulled over the edge within 30 seconds, the machine farthest from the chasm after 30 seconds will be declared the winner. Best of three successive pulls are played. Teams of two-a-side play football on a pitch 5m wide and 5m long, with a 1m wide net at opposite corners. A random order of teams compete in a knockout competition. The winner is the team that scores the most goals in three minutes. If after three minutes the result is a draw, one minute of extra time will be played and the first goal will win the match. If after a total of four minutes the result is still a draw, simultaneous penalties will be taken with an inert goalkeeper facing towards the centre. The team to score the first goal wins. For more information on Rampaging Chariots and details about how to construct a robot, visit the Rampaging Chariots website.